The days of complaining about commuting are over ー for this woman anyways. Our unnamed, heroine took a seemingly unproductive commute into her own hands by setting up a 21- inch iMac (and keyboard) on a folding tray. Women in tech, meet your new leader. No one knows her story, but we do know that she is a committed, independent woman. 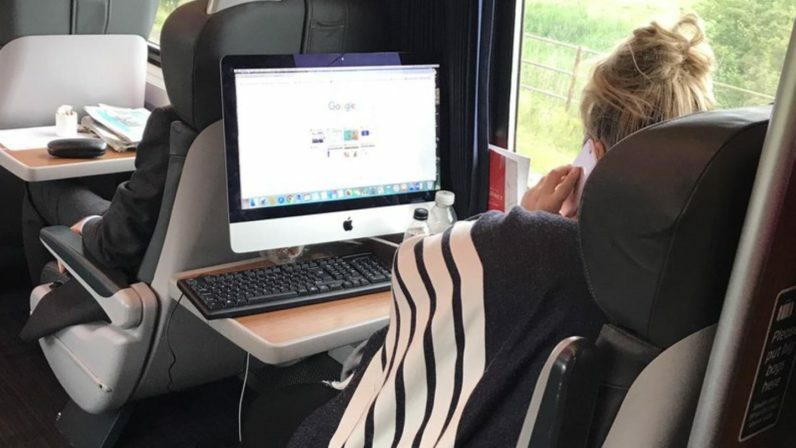 The commute queen planned this endeavor as soon as she booked her first class ticket to London. She carried all the equipment onto the train herself ー no man in sight. She hooked up a personal office space WeWork should be jealous of ー no engineer in sight. And she’s probably on call with management having none of their petty problems ー no care in sight. She is everything we commuters should aspire to be and more. All while staying hydrated and looking Pinterest perfect. Commute queen, thank you for being an example of commitment and hard work to us all.